UCSC's Ethan Kimball goes high to avoid a Cal Berkeley defender in the semifinal game of the Sierra Pacific Division Championships held at UCSC on October 14. The Slugs emerged victorious, winning 13-12. 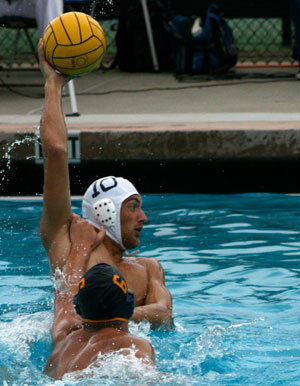 This will be a momentous weekend for the UC Santa Cruz men's water polo team. The Banana Slugs are set to make history as they head to Atlanta, Ga., as the first-ever team from a Division III school to compete in the National Collegiate Club Championship (NCCC)—a Division I tournament. UC Santa Cruz will represent the newly established Sierra Pacific Division as the No. 9 seed in a pool of 16 teams that hail from all over the country. "They're not going to be intimidated by anyone," said longtime OPERS intramural and sports club director Kevin "Skippy" Givens, attributing the Slugs' scrappy successes to their "no known predators" mentality. "Their mindset going into these big games is 'we can beat these guys.'" After narrowly missing a chance to attend the NCCC last year, the Slugs nevertheless made waves when they captured the Division III Collegiate Club Championship title in Minneapolis, Minn. That victory provided a much-needed morale boost for the team, which the campus removed from NCAA Division III status in 2009 because of budget cuts. Both men's and women's water polo then became club teams, causing them to lose the majority of their funding and facilities access. Despite these challenges, this season's men's team is determined to surpass last year's performance. They have prevailed up until now by consistently punching above their weight, winning a number of close matches against teams from Division I schools including Stanford, Cal, and Chico State. The Slugs are riding high after eking out a 7-6 win against Chico State in the division finals last month. In true underdog fashion, they won that game despite playing without their starting goalie, Blair MacDougall, who had suffered a concussion in practice earlier that week (he has since recovered). If the Slugs prevail over Oregon, their next match will be Saturday morning, likely against No. 1 University of Southern California, a school Givens describes as having "a juggernaut of a water polo program." USC's powerhouse club water polo team is known for its players' size and physical prowess, noted Givens, while Santa Cruz relies more on the team's versatile players and adaptability. "What I believe sets us apart is gamesmanship," he said, "those intangibles." Zackery Fuller, a former player who graduated from UCSC earlier this year and now volunteers as the team's coach, went into more detail. "We're one of the few teams that has the ability to sub everyone and keep running a strong program," he said. "I don't think there's another program out there that can do that." UCSC senior Kyle Smith agreed. "We don't rely on any one person to go out and score all of our goals," he explained, noting that most teams rely heavily on a few power players. When asked to comment on the potential Slugs-Trojans showdown, coach Fuller made no empty promises. "If we beat USC then we'll most likely win the championship," he said. "They're the team to beat." Update 11/16/11: The UCSC men's water polo club team defeated Oregon on Friday 7-5, advancing to the second round of the championship. On Saturday, they lost to USC 4-14. After entering as the tournament's 9th seed, they claimed 7th place.